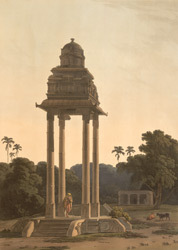 Plate 21 from the fifth set of Thomas and William Daniell's 'Oriental Scenery' called 'Antiquities of India.' Temple pavilions are a current feature of South Indian architecture and they are used to place the images in at festival times. Tall and graceful pavilions such as this one at Mahabalipuram with its tall granite pillars and brick and plaster tower probably had a swing on which to place small bronze images. It was erected during the 17th or 18th Century, and has now lost most of its tower.